Processes of regression and rudimentation are deeply involved in the evolution of life and are as important as constructive evolution. They occur in every taxonomic group and concern morphological, behavioural, as well as physiological traits. For example, whales have reduced their hind legs and the pelvic girdle. The ratite birds have convergently abandoned the ability to fly and exhibit reduced wings and sternal carina. In addition, the delicate feather structure is broken down. In the Pacific island of Tahiti, where no insectivore bats exist, noctuid moths have lost the acoustic startle response. Even the gustatory system may selectively lose taste components (e.g. sweet in cats; bitter, sweet, and umami in penguins; or umami in the giant panda after changing their diet during evolution). 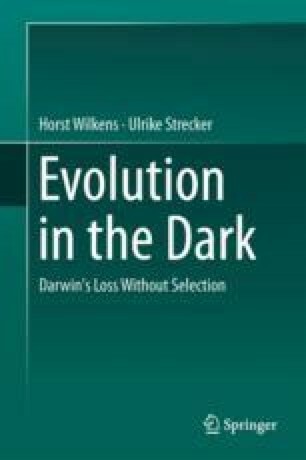 However, from the view of human beings relying on sight as the dominant sense, the most bizarre and striking examples for rudimentation—often also characterized as degeneration or regression of traits—are provided by the loss of eyes and dark pigmentation in species living in the continuous absolute darkness of subterranean habitats like caves.